The release of After Effects CS6 is proof that Adobe actually listens to customer requests and stays current with the needs of today’s filmmakers, editors, and motion graphics artists. Beyond this release’s impressive list of new features, there are much-needed and long-awaited performance improvements. Adobe has implemented several structural developments like the new ray-traced 3D rendering engine and Global Performance Cache that it rebuilt from the ground up, providing not only faster performance, but increased professional capabilities. New tools such as the 3D Camera Tracker, Rolling Shutter Repair, and variable mask edge feathering are serious professional compositing tools. The enhanced integration between After Effects CS6 and other Adobe tools makes the workflow faster and more fluid than before. The Global Performance Cache feature is the newfound power under the hood that makes After Effects CS6 perform better—even on older Macs. This is a set of technologies that work together: a global RAM cache, a persistent disk cache, and a new graphics pipeline. The global RAM cache employs reusable frames recognized anywhere on the timeline—not just adjacent frames—as well as duplicated layers or sub-comps. Cached frames are restored after an Undo/Redo operation, when layers are hidden or revealed, or when timeline settings return to a previous state. The feature allows users to experiment or “nudge” elements without a performance penalty should they change their mind or accidentally hit something that would normally wipe out the RAM preview and force a re-render. With the persistent disk cache, you can reopen a project you had previously rendered and have the cache remain intact and ready for immediate preview playback. Selecting a dedicated solid state drive (SSD) on your system—whether an internal drive on a tower or an external USB or Thunderbolt drive—to be used as your disk cache, will greatly boost performance without further taxing your system hard drive. Additionally, this cache contains frames from all projects you have opened in the same or earlier sessions, so disk cached frames from one project will be retrieved for reuse in other projects that use those same frames. 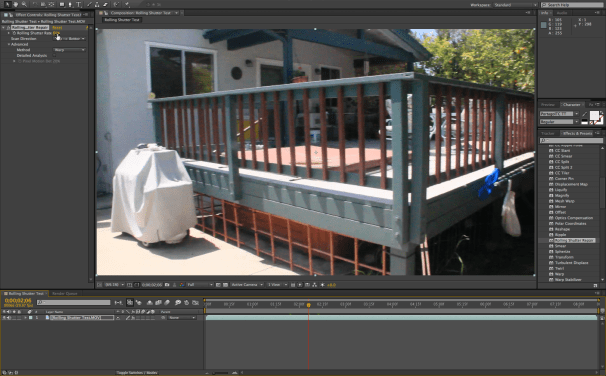 Adobe has totally reworked the After Effects CS6 3D environment. Text and shape layers can now be extruded with beveled edges, and footage clips, images, and solid layers or even sub-comps can be bent in 3D space. And all 3D objects can interact with each other to cast shadows, reflections, transparency, specular and diffused light, and more. Ray-traced rendering enhances the 3D objects with much more realism than ever before, with environment mapping and light refraction through transparent materials. 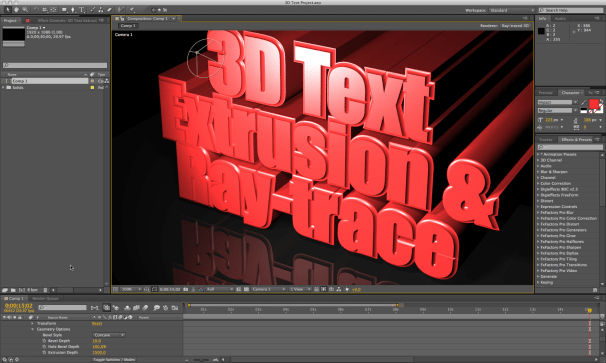 The new ray-traced 3D feature allows you to add bevels and extrusions to vector layers like text and shapes. While these significant 3D enhancements have been made, it’s clear that Adobe isn’t trying to compete in the 3D modeling or application space. The tools provided only generate some more realistic results without the need to rely on third-party plug-ins for basic animations and motion graphics, but you will still need something like Zaxworks to produce 3D elements featuring bump mapping and sophisticated texturing. You can’t import 3D models with this release, nor will the Live 3D layers from Photoshop CS5.5 work with this new 3D environment: They never truly worked interactively with other 3D elements in previous versions, so no real loss there. I do wish Adobe would have included at least some simple primitive shape objects to build on. The ray-tracer replaces the older scanline-based Classic 3D renderer, which supports refined rendering of soft shadows, light falloff, DOF, motion blur, and project through lights. The specular highlights can be intensified and focused on any object, and reflections can display focus and blur for added realism. The new ray-traced 3D feature allows you to bend comps and footage layers with added realism. Another huge leap into Creative Suite integration is the new Create Shapes From Vector Layer command, as applied to an imported Illustrator file. This allows you to import vector AI and EPS files with logos, artwork, and designs, and convert them to editable shape layers in After Effects CS6. You can manipulate the fill and stroke colors, edit the shapes, and apply shape operators including Wiggle Paths and Wiggle Transform. 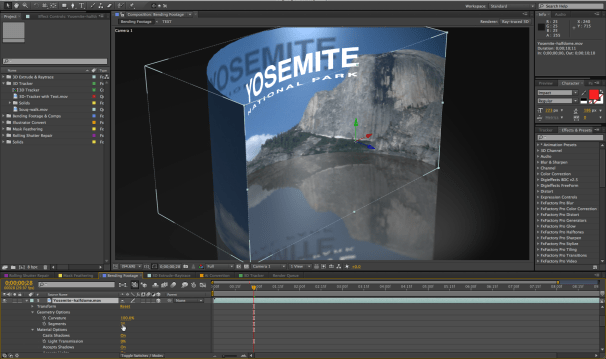 And since shapes can now be extruded in 3D, you can create animated, dimensional logos right inside of After Effects CS6. Vector images such as Illustrator and EPS files can now be converted to Shape Layers and extruded and rendered in 3D space (see example video link below). As a compositor, I find the new variable mask edge feathering feature extremely useful and something I’ve been waiting for. 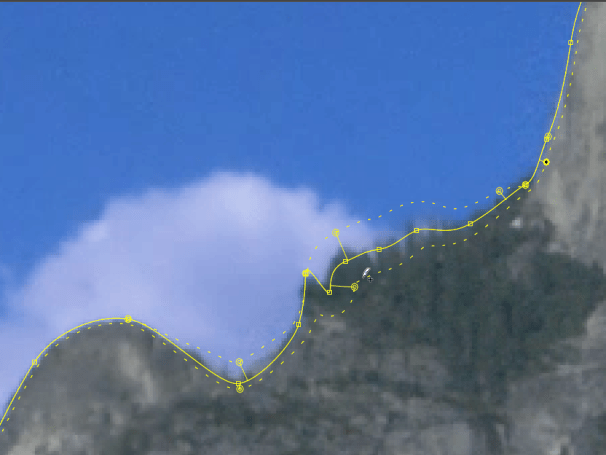 You can apply then new Mask Feather Tool to any segment of a closed mask path, which creates handles that can be adjusted to determine the amount of feathering along the path in those regions. This means that a single path can now be modified to accommodate both hard and soft edge surfaces such as motion blur in a moving object. 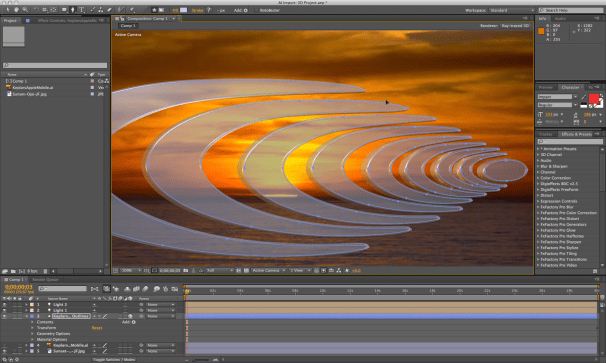 In earlier versions of After Effects, users would have to create multiple masks and stack them to obtain variable edge feathering, which is not only more tedious, but makes animating the paths over time a painful experience. With the Mask Feather Tool, the individual points can also be keyframed along the timeline and adjusted with the object being masked. Variable edge mask feathering is now possible, which greatly helps when creating masks or roto work on objects with multiple types of edges. With the release of After Effects CS5.5, Adobe introduced the Warp Stabilizer, which analyzes footage data and does an incredible job of stabilizing handheld and shaky rig footage. This has been an important tool for emerging DSLR shooters who are now producing a lot of handheld video. Yet a problem that occurs with footage shot on digital cameras with a CMOS sensor is the Rolling Shutter or “jello-cam” effect—where the vertical scan of the sensor can’t keep up with the movement of the camera, especially in side-to side panning. After Effects CS6 introduces the Rolling Shutter Repair effect that analyzes the footage and generates a corrective result. It works using one of two user-selectable algorithms, Warp or Pixel Motion, and a choice of scan directions, depending on the angle of the camera during shooting. The effect can also be keyframed on the timeline to fine-tune the adjustments and keep from over-correcting when applied to a footage clip globally. The new Rolling Shutter Repair effect analyzes footage and generates a corrective result. This is the original shot. The Rolling Shutter Repair effect uses either the Warp or Pixel Motion algorithm. This is after the shot was repaired. I found this effect worked well in most cases, but it’s not a cure for all footage. In the case of a smaller-chip camera like the GoPro sports camcorder, the jello-cam effect caused by vibrations or rapid shaking of the camera can’t be fixed by the Rolling Shutter Repair because the distortions are moving in all directions. The new 3D Camera Tracker effect automatically analyzes the motion in your 2D video footage and computes the position, orientation, and field of view of the real camera that shot the scene, and creates a new 2D camera in After Effects CS6 to match the original footage. The result is a 3D camera to which you can apply text, solid/null, and shadow-catcher layers to a target point you assign with triangulated points from the tracking point cloud. I was actually quite surprised at the results when I tried it on some hand-held footage I shot while walking—complete with a lot of camera shake. The 3D Camera Tracker followed the original camera movements amazingly well and with the addition of some motion blur, the results were pretty impressive. 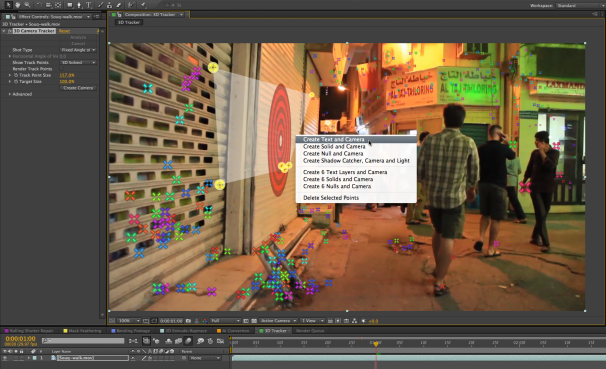 The point cloud and target created by the 3D Camera Tracker in After Effects CS6. You can hover the cursor over the point cloud in the analyzed clip and align the target with the plane to which you wish to attach your text or solid/null layers. 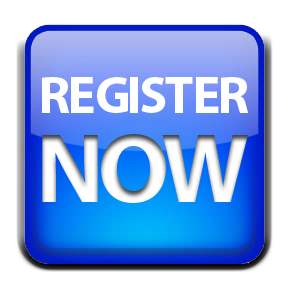 You can select more than the three automatically chosen points by shift-clicking additional points on the cloud until the target is precisely where you want it. Then, right-clicking on the target lets you create your desired 3D layers and camera. In my test, I also added a Shadow Catcher layer so the lights I used on the 3D extruded text would cast a shadow on the wall it was attached to and provide more realism. After the 3D Camera Tracker is applied and the 3D text has been extruded, the result is very realistic (see example video link below). What this feature doesn’t do well is keep track of points that move out of frame, so your footage either has to be quite short if the camera is in motion such as walking, or if you are panning more than about 60 degrees. For those shots, you’d be better off using a planar tracker such as Mocha AE, which ships with After Effects CS6 and offers a much improved Mocha AE workflow. This stand-alone software allows you to apply planar tracking to position inserted objects and create per-vertex feathering on roto-splines as well as on the Mocha Shape masks. 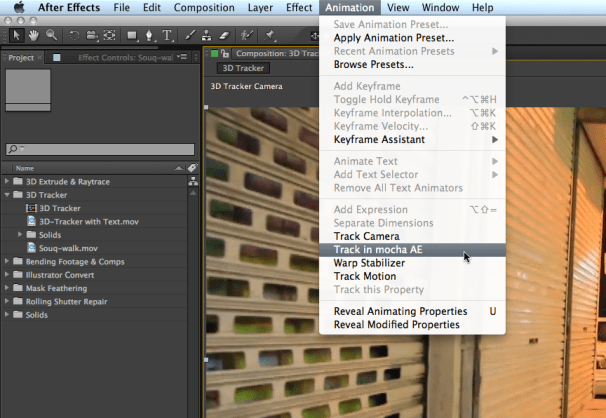 Adobe has added a direct link for tracking with Mocha AE. Previously available as a separate product from Automatic Duck, the new Pro Import After Effects is an integration tool that lets you easily import video into After Effects CS6 from other programs. It works with Avid Media Composer and Symphony AAF/OMF files, as well as with XML files from Apple Final Cut Pro 7 or earlier. Many of the translations of supported Avid and Apple files include position, scale, rotation, keyframes, composite mores, titles, speed changes, and more. 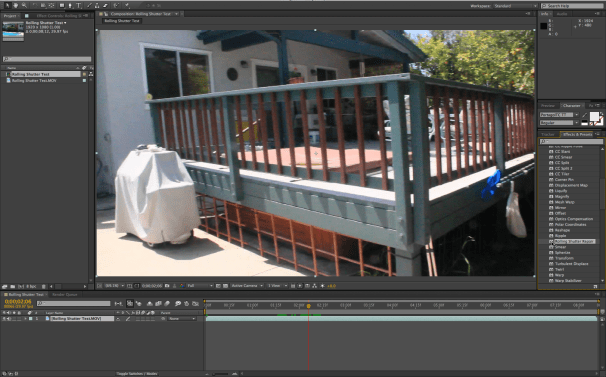 Pro Import After Effects ships with After Effects CS6. There are more than 80 new and updated built-in effects with this release, including the CycoreFX HD Suite, which supports 16-bit-per-channel color, while 35 of them support 32-bit floating point processing. This increases the color depth and reduces banding and other artifacts previously created by lower-resolution effects—especially noticeable when color correction is further applied. There are some new effects in this suite that were not previously bundled with After Effects, such as Cross Blur, Color Neutralizer, Kernel, Threads, Environment, Rainfall, Snowfall, Block Load, Plastic, Line Sweep, WrapoMatic, and Overbrights. There are also enhancements such as support for motion blur and composition’s 3D lights in the relevant CycoreFX effects. The ability to import native ARRIRAW footage from ARRIFLEX D-21 or ALEXA digital cameras is also new to After Effects CS6. There is now native support for Adobe SpeedGrade .Look files, cineSpace .csp files, and overrange IRIDAS .cube files. Added to the existing support for RED R3D files, XML, and DPX sequences, this makes After Effects CS6 a truly integral part of a professional filmmaker’s workflow. If you held out updating After Effects from CS5 or earlier, I urge you to consider this upgrade—or get left in the dust. That sounds like a strong statement, but I believe it’s justified. 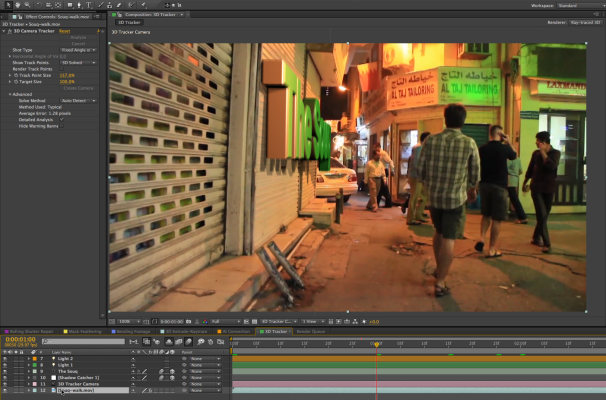 After Effects CS6 is the most important upgrade the program has received since the first major update in version 7. It’s not just a bunch of additional features and add-ons, but rather a truly rebuilt, reworked, and enhanced powerful compositing and motion graphics creation tool. While I’d still like to see some basic primitive shape objects added to the new 3D ray-trace enviroment, and there’s definitely room for improvement with the Roto Brush tool that was introduced in CS5, the enhancements in CS6 have answered the needs of professionals in today’s film industry. And with the insanely affordable upgrade options—or the new Creative Cloud subscription—there’s no reason to pass up this opportunity.